good and quick service, great bathroom! No official printer for printing online boarding pass. 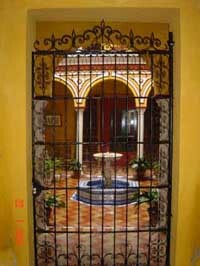 Lovely location near to center, romantic room, relaxing "patios". 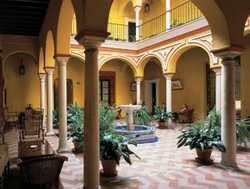 I really recommend this hotel to everyone who want to spend wonderful days in Sevilla. Absolutely delightful stay of four nights. Wonderful and unique facility, level of staff attention was appropriate and perfect, all in all a marvelous experience. Thank you! Great hotel! We loved everything about it. 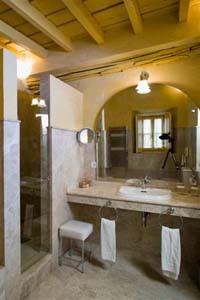 Beautiful, intimate hotel in great location. Courtyards and drinks in lobby were memorable. Absolutely gorgeous place! Loved the sitting room, the little passageways, the rooftop pool. Truly a delightful oasis. Although I thought I had paid the lowest price I could find for the stay, considering the location, it turned out that 292 euros for two nights was CONSIDERABLY more than the Englishwoman next to me at the pool had paid! Also, there have to be more umbrellas in the pool area so that people can lie in the warmth but not be burnt by the sun! I cannot remember the name of the Moroccan restaurant, the staff can tell you where to find it! The Cava del Europa was an outstanding tapas bar just down the road (it's covered in Routard recommendations so there are lots of French people eating there!). Ate lunch at la Fresquita (a "taberna") one day: amazing little brown snails (caracoles)! Yum, yum!!!!! 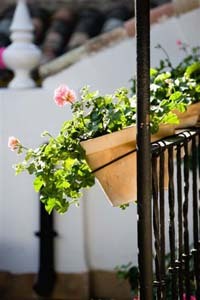 A beautiful hotel with wonderful patios and a lot of plants and flowers. Charming rooms. A great breakfast buffet and personal attention for special desires. Sometimes in the late afternoon and evening the hot water is not so hot , more lukewarm. We were last year in this hotel and we came back. That says all! It is simply the best hotel we have ever stayed in. 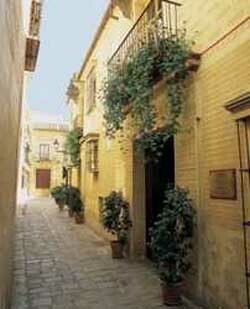 Central location, proximity to some of Spain's most symbolic sites, decorated in an Andalusian style. 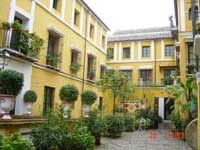 Here you can discover beautiful courtyards with fountains. Set amongst the winding labyrinth of narrow roads found at the heart of Seville’s old quarter, where modern style and classic tradition come together in the hotel Las Casas de la Judería. History fills the air in this magnificent Old World style establishment with a superb architectural style which reflects the authentic feel of the neighbourhood that surrounds it. 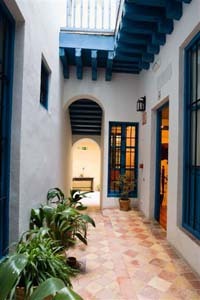 The vibrant colours that decorate the hotel’s interiors and the friendly service provided by the staff fantastically mirror the true character of Andalusia. Formed by an ensemble of traditional Andalusian-style houses, Las Casas de la Judería is characterised by its charming central courtyards dominated by a set of gorgeous fountains. The hotel offers an array of services for your enjoyment, such as live music in the animated piano bar, and a full sized outdoor pool, the perfect place to lie back and enjoy the sunny climate of southern Spain. Breakfast is in the hotel’s “Mirror Hall” which helps get the day off to a pleasant start, while dinner is in the EMPORION RESTAURANT which serves the finest Mediterranean ingredients and is the perfect ending to the day. Add all this to the excellent meeting rooms that the hotel offers, and you have the makings for a hotel that is ideal not only for travellers, but for business travellers as well. Located in the heart of Seville, the hotel Las Casas de la Judería offers superb convenient access to some of the most symbolic attractions in Spain. You will find many of the city’s most important monuments within one kilometre of the hotel, such as The Giralda bell tower of the Cathedral, or the Royal Alcázar of Seville, an impressive Moorish-style palace. Our SPA will be closed from November 1st until further notice for refurbishment. 1 child up to 10 years are free of charge per room. Children above that age are considered as adults. Breakfast is available for EUR 19.00 per person per night. Cancellation is possible until 12 midday 2 days prior to the check-in date without penalty.